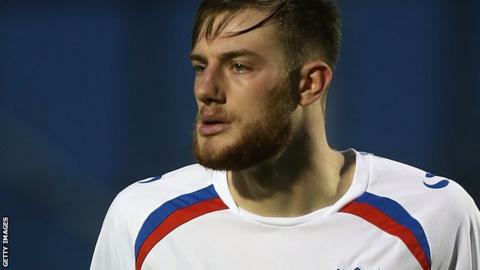 Loanees Matt Clarke and Marc McNulty helped Portsmouth ease to victory over Crawley and maintain their challenge for promotion from League Two. Clarke opened the scoring with a near-post header from Ben Davies' corner. McNulty doubled Pompey's advantage when he powerfully rifled in Enda Stevens' low cross. Gwion Edwards struck the bar from a free-kick for the Red Devils, but Gary Roberts added a third on the counter to put the result beyond any doubt. "We got ourselves into a gear which felt good, we had numerous chances and the game probably could have been over at half time. "The lads have done smashing over Christmas, they have worked ever so hard. "We probably haven't got the rewards that we thought we could, after winning at Northampton, beating Crawley. The two games sandwiched in between have been disappointing." Match ends, Portsmouth 3, Crawley Town 0. Second Half ends, Portsmouth 3, Crawley Town 0. Attempt saved. Ben Davies (Portsmouth) left footed shot from the right side of the box is saved in the centre of the goal. Enda Stevens (Portsmouth) is shown the yellow card for a bad foul. Substitution, Portsmouth. Conor Chaplin replaces Caolan Lavery. Goal! Portsmouth 3, Crawley Town 0. Gary Roberts (Portsmouth) left footed shot from the centre of the box to the bottom right corner. Assisted by Ben Tollitt. Corner, Crawley Town. Conceded by Adam Webster. Foul by Roarie Deacon (Crawley Town). Attempt missed. Matt Harrold (Crawley Town) left footed shot from the centre of the box is close, but misses to the left. Attempt missed. Kyle Bennett (Portsmouth) right footed shot from outside the box is just a bit too high. Attempt saved. Roarie Deacon (Crawley Town) header from the centre of the box is saved in the centre of the goal. Substitution, Crawley Town. Gavin Tomlin replaces Luke Rooney. Substitution, Portsmouth. Gary Roberts replaces Marc McNulty. Substitution, Portsmouth. Ben Tollitt replaces Gareth Evans. Attempt saved. Caolan Lavery (Portsmouth) header from the centre of the box is saved in the top right corner. Corner, Portsmouth. Conceded by Mitch Hancox. Corner, Portsmouth. Conceded by Jon Ashton. Gwion Edwards (Crawley Town) hits the bar with a right footed shot from outside the box. Caolan Lavery (Portsmouth) wins a free kick in the defensive half. Hand ball by Gwion Edwards (Crawley Town). Attempt missed. Kyle Bennett (Portsmouth) right footed shot from the left side of the box is just a bit too high. Hand ball by Caolan Lavery (Portsmouth). Attempt missed. Enda Stevens (Portsmouth) left footed shot from outside the box is close, but misses to the right. Second Half begins Portsmouth 2, Crawley Town 0. Substitution, Crawley Town. Joshua Emmanuel replaces Jimmy Smith. First Half ends, Portsmouth 2, Crawley Town 0.